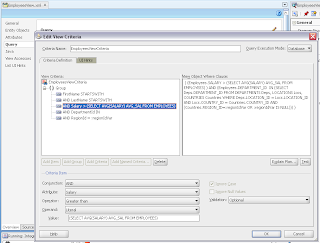 I would like to walk through advanced options in ADF BC View Criteria. It goes easy, when defining pretty much standard criteria operators and comparing attribute from VO with literal on bind variable. But when it comes to implement more complex use case with SQL expression or non standard operator, its when developers usually drop it and implement static WHERE clause. Nothing bad to use static WHERE clause and in some situations there is no other choice as only to use static WHERE clause - I will describe in my next post. Today post is about advanced declarative View Criteria features only. As you can see Salary attribute implement > operator and it contains SQL statement for the literal. 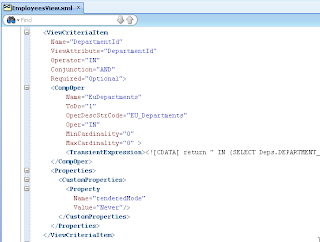 I set SQLFragment = true property in VO XML source code, this means SQL statement will be translated to SQL on runtime. 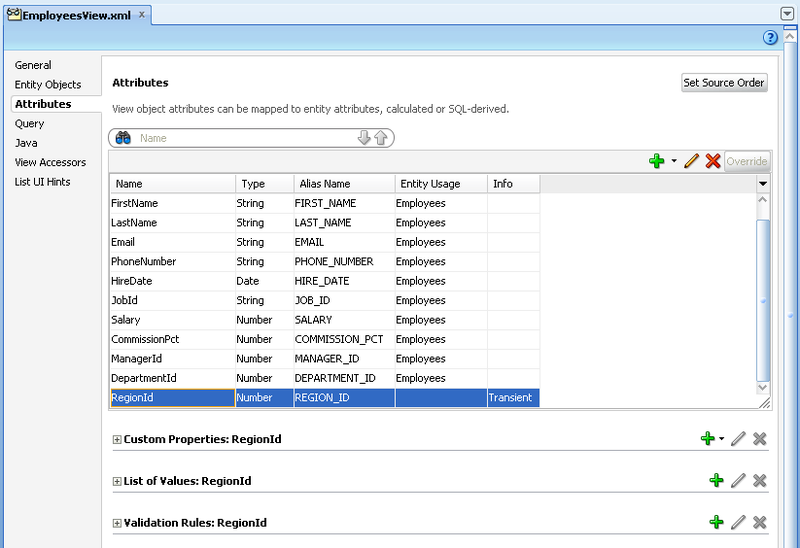 This is convenient when you want to implement standard operator, but value is retrieved from custom SQL statement returning employees with salary above average. 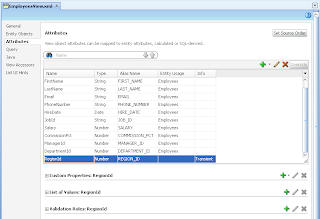 Result set is filtered by criteria from SQL fragment - employees with salary value above average and from departments in Europe, as selected in the choice list. Wow, great! I was waiting for such func for eternity! Thank you.. That was much needed. 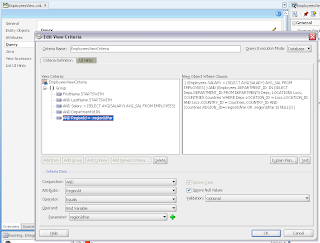 we have a requirement to create UI similar to jdeveloper view crtieria editor. Users want to create theri own complex criteria and save it. 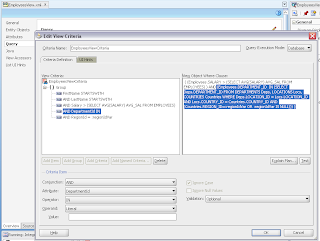 The query component supports either OR or AND does not support complex grouped criteria. Any suggestion on what would be the best way to implement? My first thought is to have DB tables that mimic ViewCriteria xml. how to implement this query as search criteria. 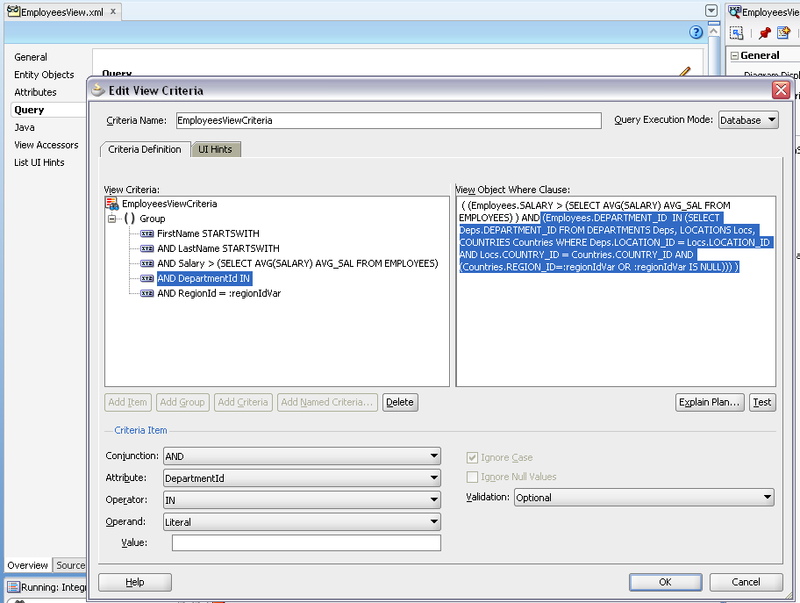 As in your example you are able to select IN from operator, how did you that I see no option available when I create ViewCriteria. 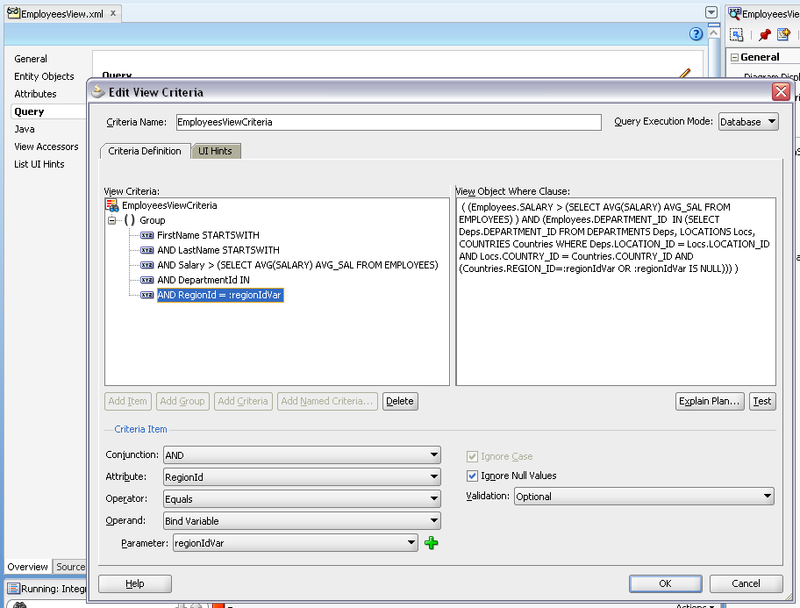 Have tried both in 11g and 12c version of Jdeveloper. Let me know how to achieve this. This is custom operator, check 3rd screenshot. Can you tell me? How do I programming get list of Value for SelectManyChoice in af query? all the case i get value succed, except selectManyChoics just get index' value include special charater as '@'. 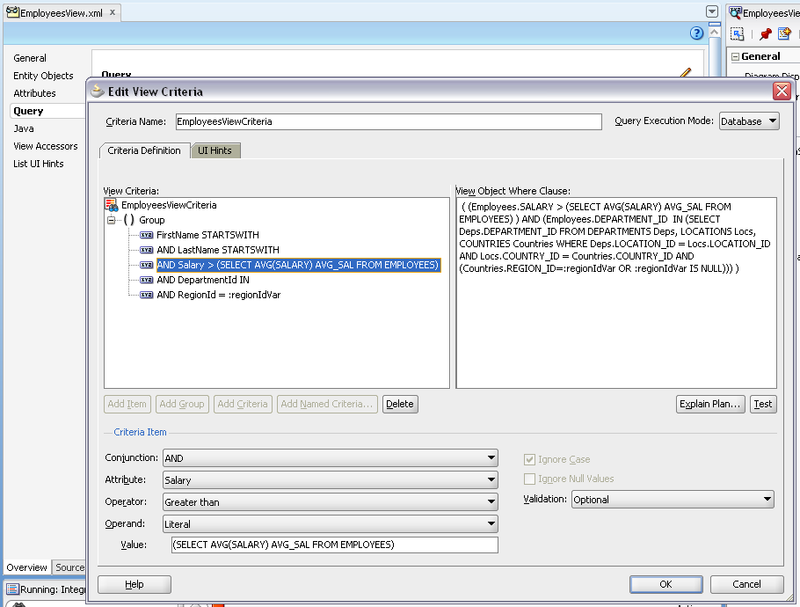 Hi, Is there a way to pass an array to a bind variable of a view object that is in IN CLAUSE of the sql query?? We meed to choose month from choice list and it need to be mapped with date column. So i need know can i pass bind variable in it? or do i have any other option?